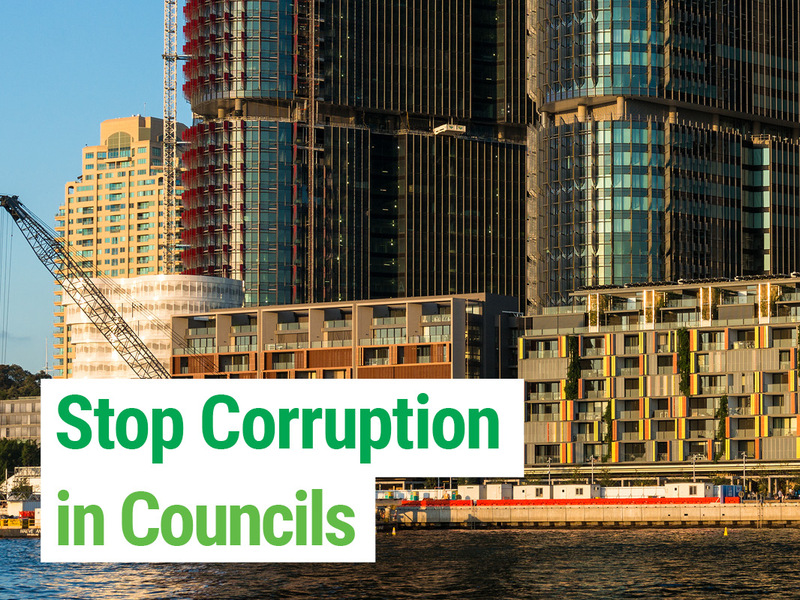 The Greens want to Stop Corruption in Local Government. There have been dozens of corruption and misconduct investigations in NSW since 1990 when 14 developers and public officials were implicated in corrupt conduct around development and rezoning in Tweed Shire. Over the years Wollongong, Bega Valley, Liverpool, Maitland, Rylstone, Walgett, Warringah and Windouran have all been dismissed. The former Labor government was embroiled in a corruption allegation at Wollongong Council and several Labor MPs were found to be corrupt by ICAC. Following the election of high numbers of Liberal Councillors to NSW Councils in 2012, the Coalition Government changed the pecuniary interest legislation to allow Councillors like Salim Mehajer to vote on rezoning and other plans which affected land owned by them, by their family, or a corporation in which they had an interest. It was not until the Coalition Government had to deal with the scandal sparked by the fallout from Auburn Deputy Mayor, Salim Mehajer in 2015 that they were forced to act to repeal this provision. The Local Government and Elections Legislation Amendment (Integrity) Bill 2016 universally fails the anti-corruption test. Despite widespread calls for Local Government Minister to ban property developers serving on local councils, the government has instead only required candidates who are property developers to disclose this fact. We currently have a situation in NSW where property developers cannot donate funds to election campaigns, including local government campaigns, but they can get themselves elected as a Councillor or Mayor, as can real estate agents. Real estate agents are not even required to disclose their occupation. Real estate agents have similar conflicts of interest to property developers if they are elected as Councillors. All decisions made by Councils should be in the best interests of the whole community and not coloured by a Councillor’s personal interests. 1. Property developers and real estate agents to be banned from standing in council elections. 2. The public to have the right to free and ready access to public interest information held by councils. GIPAA requests to be free of charge. 3. The pecuniary interest returns of Councillors and senior council staff to be made available to the public for inspection at all council meetings. 4. All council and committee meetings to be open to the public except where there are formal grounds for confidentiality under the Local Government Act. 5. Council meetings and the voting of Councillors to be recorded on all items (not just planning matters) and there be free public access to such recordings. 6. Council meetings to be webcast. The current legislation continues to allow candidates like Salim Mehajer to stand and get elected to council,, all that is required, is that such candidates disclose the fact that they are a property developer. The Greens say that there is an inherent conflict of interest in having Councillors and Mayors who are also local property developers or real estate agents. The Community need must be put ahead of the needs of developers and real estate agents. Ensuring the public has easy and free access to all public interest information and that the public are allowed to attend and participate in all council and committee meetings (or if unable to attend can observe meetings thru webcast) are important transparency safeguards for local government. Also important are ensuring accurate records of meetings are kept through the recording of meetings, with these recordings made available to members of the public if requested. The public needs to be able to keep Councillors accountable for their voting decisions and requiring that the vote of each Councillor on every item to be individually recorded allows that extra level of scrutiny, as does the availability for public inspection of the pecuniary interest forms of Councillors and senior staff at all public meetings. No Greens candidate standing for election in the 2017 Local Government elections is a property developer or real estate agent.